The timeless appeal of the Sunpan Vintage Bar Stool is amplified by its warm, inviting touches. 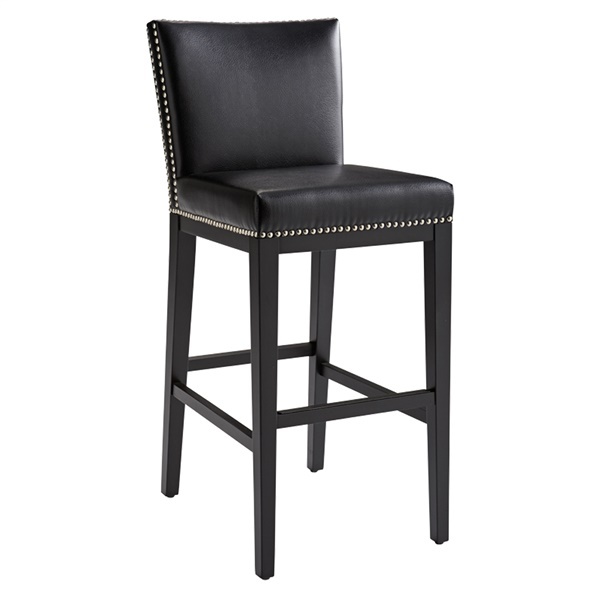 This stool features clean lines and a simple and sleek design, making it perfect for a contemporary bar space. The frame of this stool is crafted from solid wood for a look that�s sure to last. The legs are finished in espresso for a warm, rich touch, and feature a built-in footrest with a back metal scuff guard to prevent nicks, scuffs, and scratches. Ample foam padding makes the seat a treat to linger in, whether while reading the paper or enjoying a glass of wine, while leather back and seat upholstery make the chair soft, cool, and inviting. Double silver nail head trim adds a touch of shine and traditional character. This chair is upholstered in your choice of colors for a look that�s perfect for your space.